Day 1: Sailing from Ísafjörður to Hesteyri. 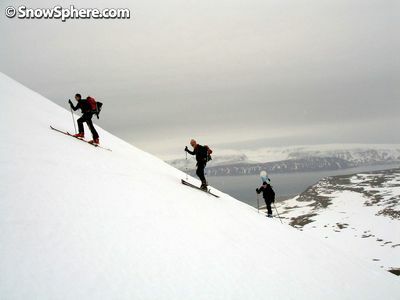 Day 2: Hiking and snowboarding in Hesteyrarfjörður. Anchor for the night there. Muscles picked and cooked. Day 3: Hiking from Hesteyrarfjörður and Snowboarding into Veiðuleysisfjörður. First descent of Mt. Lónhorn. Crazy weather during the night. Day 4: Hiking from Veiðileysufjörður and snowboarding into Lonafjörður. Sun was out but cold. 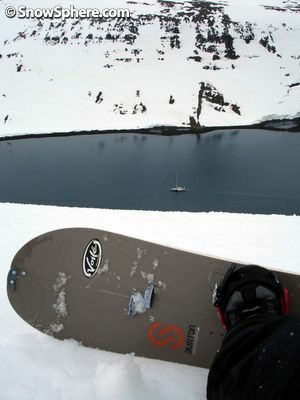 Snowboarding right into the sea. Day 5: Sailing back to Ísafjörður with sails ablast. When I was a teenager growing up in northern Iceland, my friends Valdi and Huginn worked on fishing trawlers during the summer. They went out to sea for up to two months, worked like animals, came ashore loaded with krónas, got lucky, partied hard and paid for my beers. It was the Icelandic modern day equivalent of the viking lifestyle. The ocean has always held some great adventurous mystic for me and back then I envied my friends for having such adventurous summer jobs. My envy had nothing to do with the fact that they were earning way more money than me. So what have my teenage years in northern Iceland got to do with this story, maybe absolutely nothing? Then again they may have molded and strengthened my admiration for the ocean. 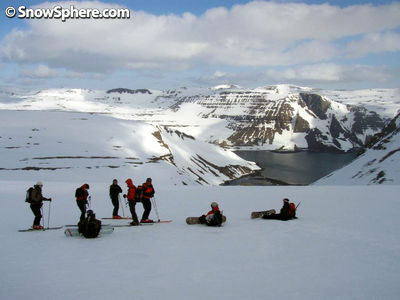 So when Rúnar and Himmi (my colleagues at Nikita) approached me about doing this sailing and snowboarding trip in Jökulfjörður (western fjords, Iceland), just before Easter 2007, my decision was really a no brainer. The Western Fjords are probably one of the most remote and untouched places you can find in Europe. 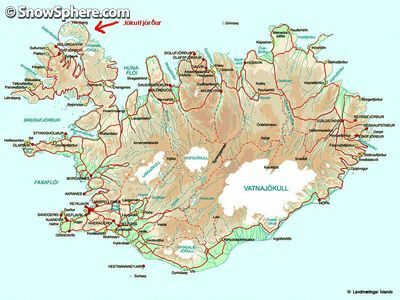 They cover 8,5 % (8700 km2) of Iceland's surface and 3 % (7.835 people) of the population live there. To put that into an extreme perspective for you, Manhattan Island covers only an area of 87,56 km2 but has a population of 1.537.195. So you could basically fit a 100 Manhattan Islands into the Western Fjords. Now imagine only 7.835 people living on a 100 Manhattan Islands. That leaves a lot of untouched space to explore and play with. About a 1000 years ago just around the time Iceland was being discovered a group of men supposedly wearing pointy hats and bearing axes sat down had a couple of ales and wrote the Viking code of ethics: Hávamál (Sayings of the high one). The sayings offer advice on everything from how to comport oneself with dignity in battle, to how to be a good host. They also offer some brilliant advice to 'would be' travelers. Being a 'would be' traveler with Viking ancestry about to head out on a boat trip to the wild west of Iceland, I feel it fitting to draw some advice from the Hávamál to help me on my way. So here on this page with my words and the words of my ancestors I bring you the story of my trip to the "Wild West" of Iceland. The stupid should stay at home"
The trip starts with 10 friends and friends of friends meeting, some for the first time, at the town of Ísafjörður. This is where we will set sail from on the Aurora, a 60 foot yacht captained by skipper Búbbi and guided by adventure seeker Rúnar Óli. They are both locals who started a travel company called Borea Adventures which offers a wide variety of trips around the Western Fjords and beyond. 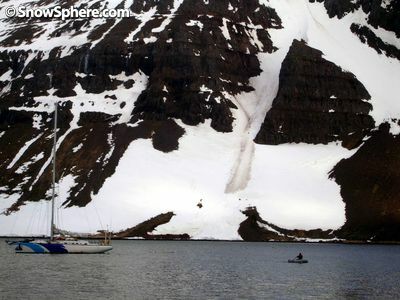 Our destination is a 2 hour sail due north to Jökulfjörður (glacier fjord). There we will spend the next four days exploring remote fjords, riding untouched slopes and enjoying each others company. Buzzing with excitement the crew heads ashore on the dingy for our fist day of hiking and riding in Hesteyrarfjörður. This place has not been inhabited since the 1970s and some houses still remain that people use as summer refuges. 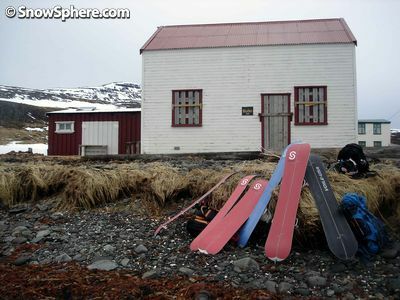 The crew's weapons of choice for this trip are a mixture of split boards, touring and telemark skis. I have been a skeptic of split boards ever since they fist came out but am riding one for the first time on this trip. Skinning up the first mountain of the day, it certainly feels good not to have the extra weight of the board on my back. 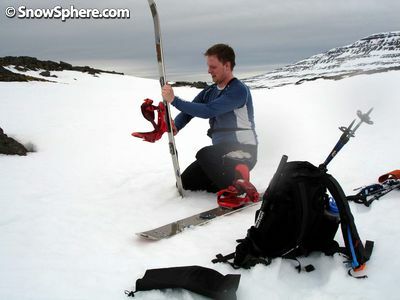 I quickly adjust to walking on the split board and have no problem keeping up with the telemark and touring guys. It's a relaxed day with so so weather and I am eager to try out the riding capabilities of my split board. It handles well in the slushy conditions and my skepticism is soon gone out the window after my first ride. The quietness, remoteness and beauty of this place is simply amazing. It's so cool yet surreal to be riding here. The last ride of the day is the best, as I come over to the last slope I am faced with the fjörd and the Aurora sailing into its mouth to come pick us up. I ride down to the ocean where captain Búbbi comes ashore to pick us up. Before we head back to the yacht he gathers muscles from a fresh water stream that falls into the ocean. Back on the Aurora he cooks up a mean muscle soup and the crew downs it with cold beers. One of the best meals I have ever had. The Aurora comfortably sleeps the twelve of us, and I fall asleep with a smile on my face eager for the next day to arrive. Take food and fodder with you"
Day three and we head ashore again in Hesteyrarfjörður but this time we are hiking over and into the neighboring fjörd called Veiðuleysisfjörður. The sun is out and our spirits are high after a good night's sleep. The hike is icy to start off with but soon softens up. As the day approaches noon the weather hits us in true Icelandic style and we get a mixture of sun, fog, rain, snow and wind. It's certainly refreshing, but the poor visibility spoils our riding experience for the first part of the day. Again the last ride of the day is the best. 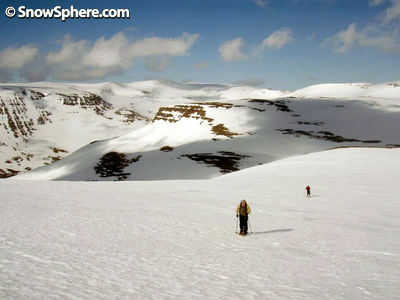 A couple of us decide to brave the elements and climb a mountain called Lónhorn. It's pretty steep and windy as we approach the top and guide Rúnar óli informs us that this will be a first descent of the whole face of this mountain. We are excited. As I head down it seems like I am falling off the earth and into the ocean; adrenalin starts flowing as I take a ridge line right down to the sea. Once I hit the beach I look back and think: "wow" - that ride was definitely what I was looking to get out of the trip. Back on the yacht we eat, drink and are merry. Captain Búbbis' cooking is exceptional again. As the evening goes on, the wind starts picking up and Búbbi informs us that there is a storm warning issued for the night in western Iceland. He finds a good place in the mouth of the fjord to anchor the yacht and we gear up in suits and safety vests ready to brave the elements. The wind speed goes up to 68 knots at its highest which is roughly 68m/s; it's a humbling experience, and in the night the anchor comes loose and we almost loose the dingy but thanks to our brilliant captain and guide all is well in the morning and we are ready for another day of adventure. Baldur one of the guys on the trip is a qualified mechanic, he tries to fix the outboard motor on the dingy which was flooded in the high winds, but without success. So we break out the muscle power and take turns rowing with the crew and equipment ashore. 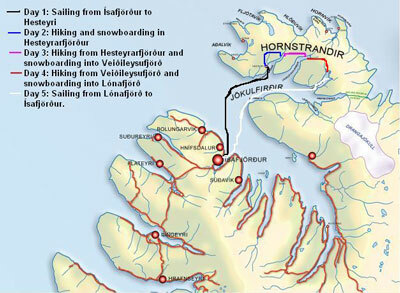 Today we will be heading from Veiðuleysisfjörður up into Lónafjörður. The sun is out but it's a cold and icy day. The view from the top is breathtaking. The ride down is icy and quite difficult for the split boards but we all make it down safe and sound. Some of us end up riding right into to the ocean; it's wet, but good clean fun. This will be our last night on the yacht on this trip and we can't think of a better excuse to finish our drink supplies and break out the guitars. The yacht party goes into the night and I have no idea when the last one of us goes to bunk but I know it is snowing outside. Or what menace meet on the road"
When we wake up the visibility is really poor and the ground covered with fresh snow on top of icy slopes we rode down yesterday. The last day of this trip is upon us. We decide against going ashore and getting one last hike and ride in, and instead to go sailing, with our sails at full mast. We take our time getting back to Ísafjörður but none of us mind as the visibility gradually gets better as the day progressives and the ocean brakes out some spectacular views for us. It is nice to relax and enjoy the sail back in good company after this unique trip. We are all sure we experienced something unique, something we definitely all want to experience again. We get in latish afternoon to Ísafjörður. Some of the crew are staying over the Easter weekend in Ísafjörður to experience the Aldrei fór ég suður festival. The festival is a series of concerts with a different twist. The festival is something worth checking out. Something very unique only to be found in this unique place. It only takes me 7-8 hours to drive back to my home in Reykjavík. I arrive exhausted but happy and full of memories. The glory of the great dead"
The pictures with this story probably say more than my words. I can recommend this trip to all adventure seekers. 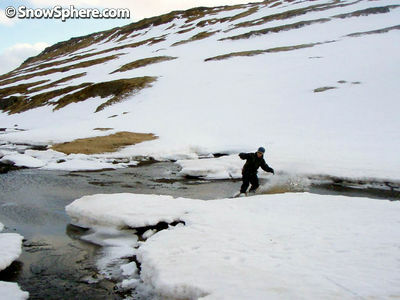 Borea Adventures offers a wide variety of possibilities with their trips. Feel free to contact them and get them to put together your dream trip. Thanks to all involved in this trip especially Captain Búbbi and Guide Rúnar Óli. Geiri is a passionate snowboarder, Marketing Coordinator for Nikita Clothing and former Director of the ISA (Icelandic Snowboard Association). Króna is the Icelandic currency. The average monthly salary of a sailor working on a fishing trawler in Iceland in 1993: USD$4320. The averge monthly salary of a person working in a fishing plant in Iceland in 1993: USD$ 2100. 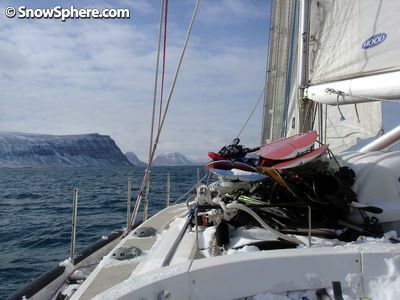 If you fancy taking to the Icelandic Fjords to ski, snowboard and sail, visit Borea Adventures.